Cheaper by the Dozen (1950) is one of the classic movies Netflix Instant added in July. Netflix hasn't exactly been generous with its new classic movie offerings in recent months, but the streaming giant added five great films this month that are a summer treat for old Hollywood fans. 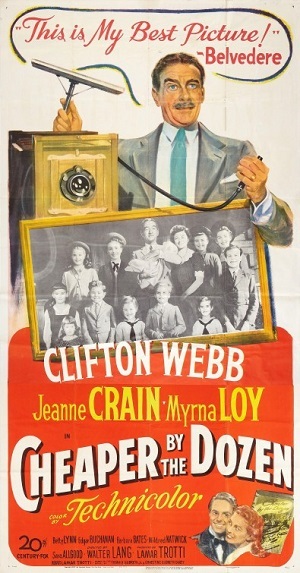 Cheaper by the Dozen (1950): This bittersweet family comedy set in twenties New Jersey features Clifton Webb and Myrna Loy as parents of a large family who live by the philosophy that children are "cheaper by the dozen." Webb is wonderful here as the strict but tender father. Batman: The Movie (1966): The Caped Crusader (Adam West) and Boy Wonder Robin (Burt Ward) protect the good citizens of Gotham in this film spin-off of the popular TV show. Batman: The Movie features villains The Joker (Cesar Romero), The Riddler (Frank Gorshin), Catwoman (Lee Merriwether), and The Penguin (Burgess Meredith). Gentlemen Prefer Blondes (1953): This colorful musical about two best friends (Marilyn Monroe and Jane Russell) who are on the hunt for rich husbands features Monroe's iconic performance of "Diamonds Are a Girl's Best Friend." Hello, Dolly! (1969): Barbra Streisand takes on the role of 19th century matchmaker Dolly Levi, who travels to Yonkers, N.Y., to find the perfect mate for a curmudgeonly millionaire played by Walter Matthau. This film, which was directed by Gene Kelly, isn't considered one of Babs best, but it still has its moments, especially the lavish "Hello, Dolly!" number. Nevada Smith (1966): This Western stars Steve McQueen as a young man of white and American Indian ancestry who sets out to avenge the brutal killing of his parents.